Instead of activating their imagination, children are overstimulated by all that extensive screen time. Achtung! 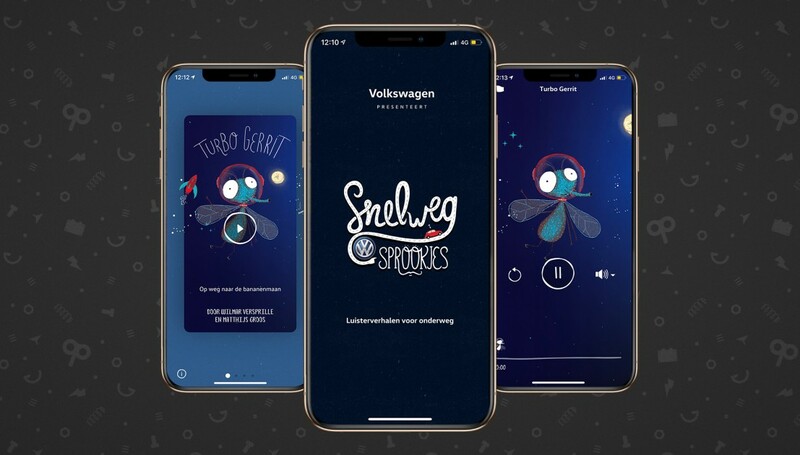 developed ‘Snelweg Sprookjes’ for Volkswagen. An app with location based interactive audiobooks that transform ordinary road objects into magical characters of a story. The main goal of the app is to make children curious about looking outside again as they ride in the car - but also to give parents a good alternative for the use of screens. With 'Snelweg Sprookjes', Volkswagen wants to bring imagination back to where it has always belonged: the back seat. ‘Snelweg Sprookjes’ is developed for Dutch children between 4-11 years old and can be downloaded for free. The app uses a custom developed story-engine that creates unique tales based on the location of the user. To allow the stories to react to the environment, Robot Kittens scanned all Dutch highways, by using all available data-sources, manual checking and computer vision to identify objects like bridges, windmills, trees, petrol stations and other main objects to transform them into story elements. In collaboration with some of the top children book writers, ACHTUNG! created a story for every road by writing dynamic story chapters that are triggered by objects along the journey. Each road is different, so as a result every story is different as well. ‘Road Tales’ connects online and offline in an experience that allows kids to explore their fantasy. The only thing kids need to do is listen and let their imagination transform their surroundings. The story engine combines dynamic story-elements, music and other dynamic elements to produce a natural feeling story based on all the dynamic elements available at the current location. This means that smart use of location-data, fillers and other elements need to come together to create the 'magic' feeling of a story just for you. Apart from the story engine, geo-target gathering and interface we needed to use gps data in a smart way and create a sort of satnav application in the background. We needed to track the location, speed, direction etc. To be certain the geo-targets could be seen from the current location or calculate the time for the car to arrive at a certain point. The application has all geo-information in a local database, so no connectivity was needed to use the app. © 2019 Robot Kittens - VAT Number: NL855774848B01, Chamber of Commerce: 64677303.